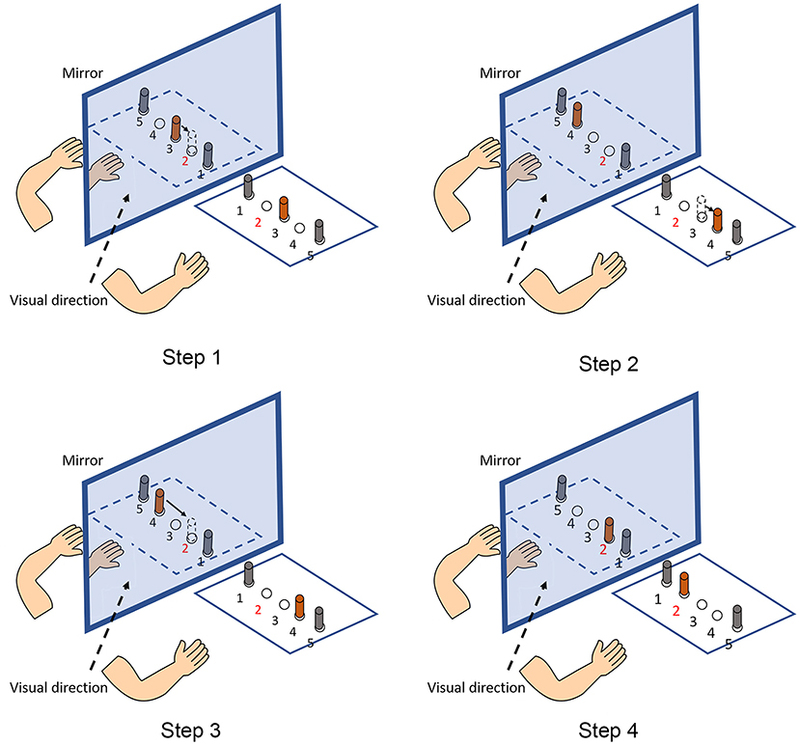 Objective This study was designed to examine the feasibility of immersive virtual reality(VR) mirror therapy for upper limb paresis after stroke using a head-mounted display, and provide preliminary evidence of efficacy. Design Ten outpatients with chronic stroke, upper limb hemiparesis, and a low predisposition for motion sickness completed a 12-session program of 30 minutes each of immersive VR mirror therapy. The VR system provided the illusion of movement in the hemiparetic upper limb while suppressing the visual representation of the non-paretic side. Feasibility was assessed via patient compliance, adverse event tracking, the System Usability Scale, and the Simulator Sickness Questionnaire. Preliminary efficacy was evaluated using the Fugl-Meyer Upper Extremity (FM-UE) and Action Research Arm Test. Results Immersive VR mirror therapy for patients with chronic stroke was safe, well-tolerated, and without adverse events, such as simulator sickness. Motor outcomes revealed a small improvement for the FM-UE from 21.7 (SD= 8.68) to 22.8 (SD= 9.19) that did not achieve statistical significance (p=0.084). Conclusion Four weeks of immersive virtual reality mirror therapy was well-tolerated by chronic stroke patients. Our findings support further clinical trials of immersive VR technologies and visually-enhanced mirror therapies for stroke survivors. Individuals with stroke are often left with persistent upper limb dysfunction, even after treatment with traditional rehabilitation methods. The purpose of this retrospective study is to demonstrate feasibility of the implementation of an upper limb myoelectric orthosis for the treatment of persistent moderate upper limb impairment following stroke (>6 months). Methods: Nine patients (>6 months post stroke) participated in treatment at an outpatient Occupational Therapy department utilizing the MyoPro myoelectric orthotic device. Group therapy was provided at a frequency of 1–2 sessions per week (60–90 minutes per session). Patients were instructed to perform training with the device at home on non-therapy days and to continue with use of the device after completion of the group training period. Outcome measures included Fugl-Meyer Upper Limb Assessment (FM) and modified Ashworth Scale (MAS). Results: Patients demonstrated clinically important and statistically significant improvement of 9.0±4.8 points (p = 0.0005) on a measure of motor control impairment (FM) during participation in group training. It was feasible to administer the training in a group setting with the MyoPro, using a 1:4 ratio (therapist to patients). Muscle tone improved for muscles with MAS >1.5 at baseline. Discussion: Myoelectric orthosis use is feasible in a group clinic setting and in home-use structure for chronic stroke survivors. Clinically important motor control gains were observed on FM in 7 of 9 patients who participated in training. Stroke is a leading cause of long term disability in the United States. Traditional rehabilitation does not restore normal motor control for all stroke survivors, and upwards of 50% live with persistent upper limb dysfunction. This leads to diminished functional independence and quality of life. Motor learning-based interventions have shown promise. However in today’s health care milieu, for those with chronic motor deficits, provision of the intensive rehabilitation necessary to provide motor learning-based interventions is challenging. Therefore, new treatment methods are needed under these constraints. Objective: Limitations with manual dexterity are an important problem for patients suffering from hemiparesis post stroke. Sensorimotor deficits, compensatory strategies and the use of alternative grasping configurations may influence the efficiency of prehensile motor behavior. The aim of the present study is to examine how different grasp configurations affect patient ability to regulate both grip forces and object orientation when lifting, holding and placing an object. Methods: Twelve stroke patients with mild to moderate hemiparesis were recruited. Each was required to lift, hold and replace an instrumented object. Four different grasp configurations were tested on both the hemiparetic and less affected arms. Load cells from each of the 6 faces of the instrumented object and an integrated inertial measurement unit were used to extract data regarding the timing of unloading/loading phases, regulation of grip forces, and object orientation throughout the task. Results: Grip forces were greatest when using a palmar-digital grasp and lowest when using a top grasp. The time delay between peak acceleration and maximum grip force was also greatest for palmar-digital grasp and lowest for the top grasp. Use of the hemiparetic arm was associated with increased duration of the unloading phase and greater difficulty with maintaining the vertical orientation of the object at the transitions to object lifting and object placement. The occurrence of touch and push errors at the onset of grasp varied according to both grasp configuration and use of the hemiparetic arm. Conclusion: Stroke patients exhibit impairments in the scale and temporal precision of grip force adjustments and reduced ability to maintain object orientation with various grasp configurations using the hemiparetic arm. Nonetheless, the timing and magnitude of grip force adjustments may be facilitated using a top grasp configuration. Conversely, whole hand prehension strategies compound difficulties with grip force scaling and inhibit the synchrony of grasp onset and object release. Cerebrovascular accidents (stroke) are a frequent cause of disability (1) and the recovery of upper-limb function in particular, is a key determinant of independence in activities of daily living (2). Broadly speaking, the physical impairment experienced by patients is characterized by loss of strength, abnormal movement patterns (pathological synergies), and changes in muscle tone to the side of the body contralateral to the stroke (3, 4). This presentation is commonly referred to as hemiparesis and its severity tends to reflect the extent of the lesion to the corticospinal tract (5). Subtle changes in movement kinematics and hand function on the ipsilesional upper-limb have also been documented and may be the consequence of direct impairment of ipsilateral motor pathways (6, 7), as well as reorganization of the non-lesioned hemisphere to support recovery of motor-function in the hemiparetic limb (8–10). Above all though, patients living with stroke find that limitations with manual dexterity of the hemiparetic arm have the most significant effect upon their ability to carry out activities involving hand use in daily life (11). These impairments in patient hand function manifest in multiple different aspects of motor performance. This may include reduced strength (3), loss of individuated finger control (12), and abnormal force control at the level of the fingers (13). Increased muscle tone and spasticity though the flexors of the wrist and hand may further compound these difficulties and inhibit the ability to open the hand in preparation for grasping (14). Atypical reaching and grasping patterns are often seen to emerge both as a consequence of and as a response to the motor dysfunction (15, 16). Unfortunately, rehabilitation of upper limb impairments proves to be challenging. Whilst numerous therapeutic modalities (e.g., bilateral training, constraint-induced therapy, electrical stimulation, task-oriented, high intensity programs) have been evaluated in clinical trials, none have demonstrated consistent effects upon hand function (17–19). Indeed, previous research papers have described therapy outcomes in upper limb rehabilitation post stroke as “unacceptably poor” (20). Ideally, the design of neurorehabilitation programs should be grounded upon an understanding of basic mechanisms involved in neural plasticity and motor learning (21, 22). Part of this process implies coming to terms with the factors which characterize the disorganization in voluntary motor output (21). However, the majority of clinical tools currently used for evaluating hand function distinguish motor performance according to ordinal rating scales or task completion time (e.g., Frenchay Arm Test, Jebson-Taylor Hand Function Test) (23, 24). These kinds of assessments lack sensitivity and may prove insufficient for detecting the presence of mild motor deficits or subtle, yet clinically important changes in hand coordination (25, 26). Evidence based frameworks for hand rehabilitation have specifically called for the integration of new technology to support patient assessment and treatment planning (27). Despite this, the transposition of technology for upper limb rehabilitation from the research domain into clinical practice has been limited (28, 29). In the assessment of manual dexterity, the underlying challenge involves analyzing sensorimotor function of the hand with respect to its interaction with objects in the environment (30). Successfully managing grasping and object handling tasks requires skilled control of prehensile finger forces. In healthy adults, grip forces are regulated to be marginally greater than the minimum required to prevent the object from slipping (31). This safety margin is calibrated according to the shape, surface friction and weight distribution of the object (32, 33). As the hand moves through space (lifting, transporting, object placement), grip force is continually modulated, proportional to the load forces associated with the mass and acceleration of that object (34). This temporal coupling between grip and load forces is considered a hallmark of anticipatory sensorimotor control (35). Disruption to motor planning, volitional motor control or somatosensory feedback may lead to a breakdown in the timing and magnitude of grip force adjustments. Numerous studies have examined grip force regulation in neurological pathologies including cerebellar dysfunction (36), peripheral sensory neuropathy (37, 38), Parkinson’s disease (36, 37, 39, 40) as well as congenital and acquired brain lesions (13, 36, 41–45). For patients suffering from hemiparesis post stroke, difficulty with coordinating the grasping and lifting action are frequently associated with temporal discrepancies between grip forces and load forces (46). The cerebral hemisphere implicated in the CVA (13, 47) and the extent of the resulting sensory deficits (48, 49) have also been observed to influence anticipatory grip force scaling. This body of work highlights the potential interest of using instrumented objects for the diagnosis and evaluation of the impairments associated with hemiparesis (45, 46, 48, 50–53). As it stands, these objective studies of hand function post stroke have focused primarily upon either the lifting or the vertical movement components in object handling. To a certain extent, this limitation has been related to technical restrictions. Other than a handful of studies by Hermsdorfer et al. (8, 49), research in this field has predominantly used manipulanda designed for the study of precision grip, where strain gauge force transducers are attached to a separate base unit [e.g., (23–25, 29, 33, 35, 37)]. These devices cannot be freely handled by subjects, much less a person with an upper-limb movement disorder. Indeed, patients with hemiparesis often experience specific impairments with precision grip (53) and regularly use alternative grasping strategies such as whole hand grasping (15, 16, 54). Previous researchers have hypothesized that these alternative grasp strategies may impact grip force scaling (55) and compromise patient ability to manage hand-object-environment relationships during object manipulation (56). Figure 1. Illustration of the iBox device and the experimental setup. (A) The iBox instrumented object. (B)Setup for the experimental procedure. Initial positions of the iBox and hand start area are indicated by the dotted lines. The gray shaded rectangle indicates the deposit area for the top grasp task. Objective: The aim of this trial was to compare the effect of movement-based mirror therapy (MMT) and task-based mirror therapy (TMT) on improving upper limb functions in patients with stroke. Methods: A total of 34 patients with sub-acute stroke with mildly to moderately impaired upper limb motor functions. The participants were randomly allocated to one of three groups: MMT, TMT, and conventional treatment (CT). The MMT group underwent movement-based mirror therapy for around 30 min/day, 5 days/week, for 4 weeks, whereas the TMT group underwent dose-matched TMT. The CT group underwent only conventional rehabilitation. The MMT and TMT groups underwent CT in addition to their mirror therapy. Blinded assessments were administered at baseline and immediately after the intervention. Upper limb motor functions, measured using Fugl-Meyer Assessment-upper extremity (FMA-UE), Wolf Motor Function Test (WMFT), and hand grip strength; upper limb spasticity, measured using the modified Ashworth scale (MAS); and activities of daily living, measured using the modified Barthel index (MBI). Results: A significant time-by-group interaction effect was noted in FMA-UE. Post-hoc analysis of change scores showed that MMT yielded a better effect on improving FMA-UE than the other two therapies, at a marginally significant level (P = 0.050 and 0.022, respectively). No significant interaction effect was noted in WMFT, hand grip strength, MAS, and MBI. Conclusion: Both MMT and TMT are effective in improving the upper limb function of patients with mild to moderate hemiplegia due to stroke. Nevertheless, MMT seems to be superior to TMT in improving hemiplegic upper extremity impairment. Further studies with larger stroke cohorts are expected to be inspired by this pilot trial. Mirror therapy (MT) has been shown to be a useful intervention for rehabilitation of upper limb functions following stroke, since the first attempt by Altschuler et al. (1). The neural correlate of MT remains under investigation. Three main theories explaining the neural mechanism underlying the clinical efficacy of MT have been proposed (2). The first theory hypothesizes that the neural correlate of MT is the mirror neuron system (MNS), which is defined as a class of neurons that fire during action observation and action execution (3). It is assumed that the MNS can be triggered when people are observing mirror visual feedback (MVF) generated in MT (4, 5). The affected cortical motor system can be accessed via the MNS owing to their functional connections (6). The second theory, supported by several studies with transcranial magnetic stimulation (TMS), suggests that a potential neural mechanism underlying the effect of MT can be the recruitment of the ipsilesional corticospinal pathway. Indeed, many TMS studies have demonstrated the increment of motor-evoked potentials of the ipsilesional primary motor cortex in participants with stroke when viewing MVF (7), which indicates a facilitatory effect of MVF on the ipsilesional corticospinal pathway. The last theory attributes the effect of MT to the compensation of restricted proprioception input from the affected limb and the enhancement of attention toward the paretic upper limb (8), which may contribute to the reduction of the learned non-use in patients with stroke (1). A substantial number of randomized controlled trials (RCTs) have demonstrated that MT is useful in improving upper limb functions after stroke (9–12). A recently published meta-analytic review identified a moderate level of evidence supporting the effects of MT on improving upper limb motor functions (Hedges’ g = 0.47) and activities of daily living (ADLs) (Hedges’ g = 0.48) in patients with stroke (13). In the meta-analysis (13), the heterogeneity of conducting MT was obvious across studies. One major category of MT is movement-based MT (MMT), in which participants practice simple movements such as wrist flexion and extension, or finger flexion and extension, with their unaffected hands when viewing the MVF generated by a physical mirror placed at their mid-sagittal plane (14–16). Another category of MT is task-based MT (TMT), in which participants perform specific motor tasks with their unaffected hands, such as squeezing sponges, placing pegs in holes, and flipping a card, while they are viewing the MVF (12, 17). In some studies, researchers applied MMT in the first few sessions and subsequently applied TMT in the following sessions, constituting a hybrid MT protocol (9, 10, 18). MMT and TMT were also described as intransitive and transitive movements in some studies (9, 10). However, a sub-group meta-analysis comparing MMT and TMT was not carried out in the meta-analysis study (13). Initially, MMT was used for alleviating phantom pain after amputation and for treating upper limb hemiplegia after stroke (1, 19). Subsequently, the effect of MMT in stroke upper limb rehabilitation has been systematically investigated by many clinical trials (14–16, 20). Arya et al. were the first to compare the effects of TMT with those of conventional rehabilitation on upper limb motor recovery after stroke, and they found a superior effect of TMT (12). The main rationale that Arya et al. mentioned was that the response of the MNS was better for object-directed actions than for non-object actions (12, 21). In a recent study comparing the effects of action observation training and MT on gait and balance in patients with stroke, the results showed that action observation training had significantly better effects on the improvement of balance functions than MT (22), indicating that action observation may be different from MT in terms of their neural mechanisms. In other studies in which TMT was introduced or combined with MMT, the authors did not explain why they employed TMT (9–11). Figure 3. An example of the process of “fault and correction.” The given task is that participants are required to transfer an object placed in the No. 3 hole (in orange color) to the No. 2 hole (Step 1). However, participants usually move the object to the No. 4 hole when they are viewing the mirror reflection (Step 2). Then, participants realize the fault and transfer the object it to the No. 2 hole (Steps 3, 4). Joint stiffness, especially in the hand, can greatly limit function and the ability to complete activities of daily living. As hand therapists, it is our role to reduce passive stiffness in joints and ultimately to improve function.1 Previous research has focused on a variety of avenues to attenuate joint stiffness, two of which are static progressive orthoses and dynamic orthoses.2 It has been stated that static progressive orthoses are more effective at treating chronic stiffness in the hand via stress relaxation which allows the tissue to reach a plastic deformation state. The aim of my thesis work is the application and validation of an electromyographic biofeedback (EMG-BF) system in post-stroke rehabilitation setting. The absolute number of strokes is expected to dramatically increase in coming years, thus suggesting a need for strategies to improve post-stroke assistance and rehabilitation. The electromyogram (EMG) signal has shown good perspectives in the analysis of movements and motor impairment and the introduction of closed loop rehabilitation strategies revealed an increase of patient self-consciousness and motivation. Results are promising but a lack in the optimization of the devices for the application in the clinical context has been revealed. The device and the related software employed in the present research have been specifically conceived with this purpose. 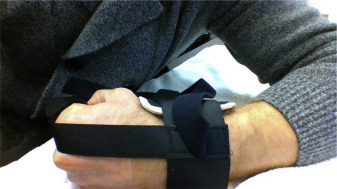 The device has been optimized during a clinical pilot study and then, a complete clinical trial has been started to investigate the characteristics of post stroke patients eligible for a rehabilitation therapy with the device, and the short-term clinical effect of the therapy on the recovery of the hand functionality. A statistical analysis has been performed on the dataset collected for 3 months. The data analysis included both clinical data and data collected from patients with the device during the execution of the experimental protocol. The preliminary results of the data analysis have confirmed the suitability of the system for its intended use and highlighted that the patient ability of controlling the EMG-BF based device is related to the degree of impairment with minimum p-value<0.001, depending on the patient clinical picture and on the exercise performed. Moreover, according preliminary results observed on four patients that received a 15 hours therapy for 3 weeks, the improvement of the parameters related to the hand and fingers motor function, suggests the efficacy of the therapy. Finally, aspects related to the analysis of continuous motions of the wrist performed during the therapy have been investigated and the relevance of the temporal information in the interpretation of this type of movements has been revealed (p<<0.01).